The face of William Shakespeare? 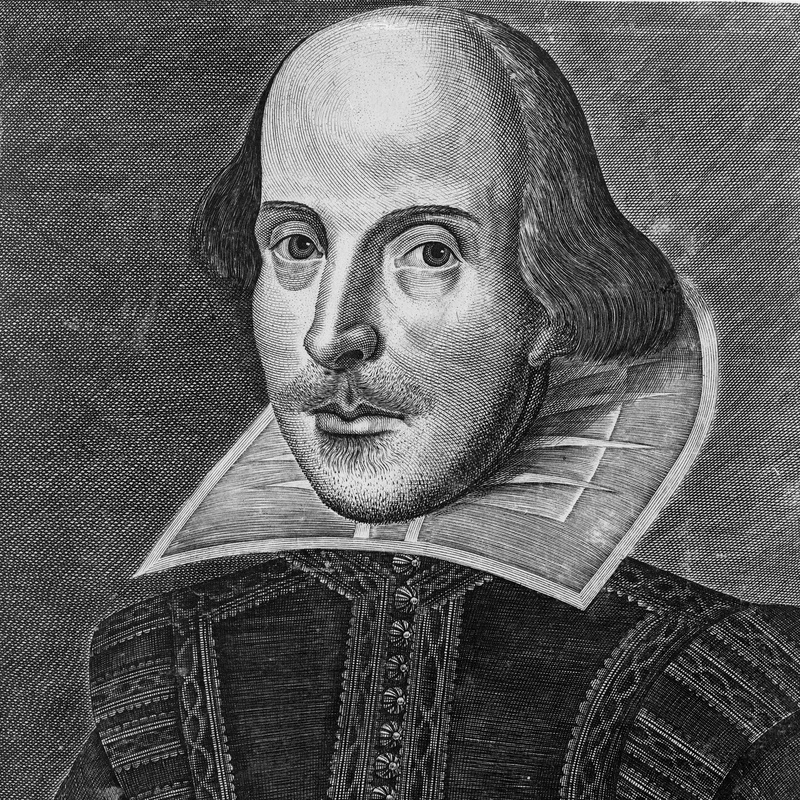 There are many things surrounding William Shakespeare which is shrouded in mystery, one is how he may have looked and whether the portraits Cobbe, Chandos and Droeshout may answer that question. Below Steven Wadlow tells of how the painting haning for years in his childhood home turned out to be a possibly contemporary of a man that very well may be the Bard. 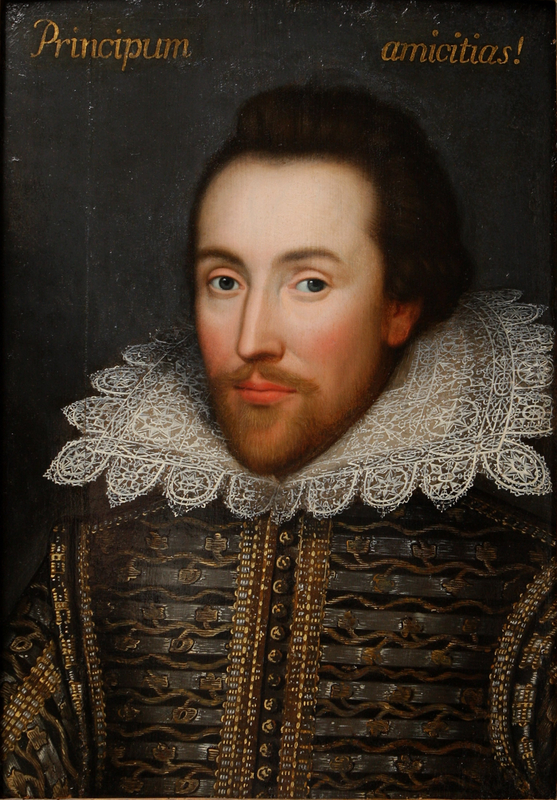 When and how did you realise that the portrait in question might be William Shakespeare? Having just turned 50, I have known the Portrait all of my life. My father (now retired) was an antique dealer and picture frame restorer and he acquired it many years ago. As a child I was rather wary of it, as it followed you around the room, like the portraits in Scooby Doo! It has been hanging on the wall in the corner of the sitting room in a small 200- year old house on the corner of a road called Chapel Street in the Shires. I say this, as it is rather ironic that Shakespeare’s home in Stratford upon Avon was on the corner of Chapel Street and so if it is The Bard, he should have felt at home! Alas, he no longer sits on the wall and is now in safe storage and we hope that it will not be too long before he can be displayed for all to see. For all of the time he has sat quietly on the wall, we have sometimes wondered whom he may be, but I confess, most of the time he has sat there quietly and anomalously. But, to get to your question, early in December 2013 my parents were watching a Time Team Special about the excavation of Shakespeare’s home ‘New Place’ and during the course of the program an image of Shakespeare (that my parents had not previously seen) was frequently used. The image was The Cobbe portrait (that had only been ‘discovered’ as a probable portrait of the Bard some four years previously). On seeing this image my parents both thought it looked similar to the portrait hanging above their television and called me, saying that they thought our portrait may be Shakespeare and I should have a look on the internet to see what I thought. I did have a quick look, thought it similar, but to be honest, I thought no more of it. At that time we had no idea what a discovery this would be and what a tenuous area Shakespeare’s portraits were, indeed I thought they were probably ‘ten a penny’ and I was slightly put off by the Coat of Arms on the portrait bearing no resemblance to the Shakespeare arms. And then there was a remarkable coincidence, after all of these years with little comment, a neighbour visited my parents’ home for Christmas drinks a couple of weeks after the Time Team program and brought with them their mother who had not visited before. When she came into the sitting room she commented that she liked the “copy of Shakespeare on the wall. My father took it off the wall and showed her it was not a copy and I think she had to sit down and have a drink! It turned out that the lady lectures in art and Literature (although not a Shakespeare expert). She pointed out that we should really look into it further, thus the start of my research. How have you gone about your research? I have to admit straight away, that although I have always enjoyed research and History I not a researcher, I also ashamed to admit, that prior to my research beginning I knew very little about Shakespeare’s work or his life. I have since learned a great deal about his life (but I am still very ignorant regarding his works, but that is something I am trying to address). I have found his life absolutely fascinating and I am fascinated by the period in general, so if nothing else, this whole episode will have ignited a passion for learning about him and the period that will I am sure remain with me for life. 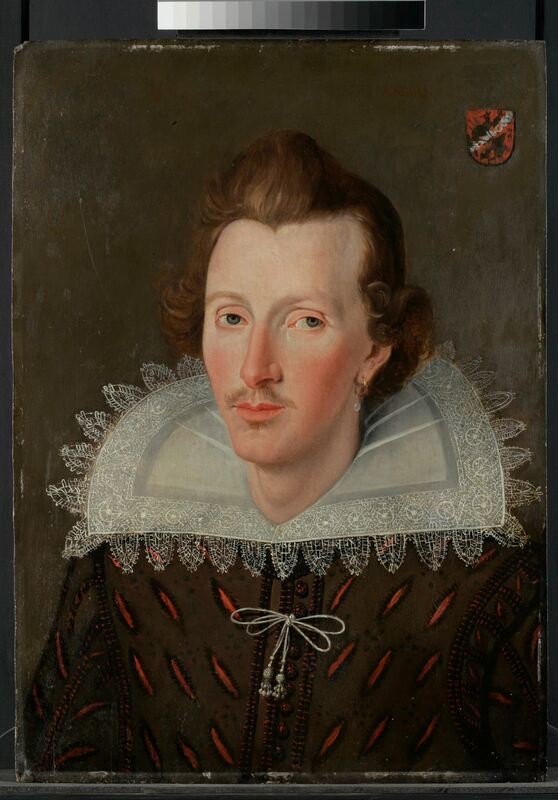 So far as researching the portrait and Shakespeare’s life, I started (and apologies to my family) from scratch, basically on the internet and then reading any book I could get hold of on portraits of the period and Shakespeare. I was not sure if our portrait was Shakespeare, it did not at first site look to me like the Droeshout or the Chandos, but I could see similarities with the Cobbe. I watched a video called Battle of Wills about the research into the sanders portrait and copied their pattern of research to a degree. I made very crude cut outs (scaled) and did my own version of ‘photo shop’ (which I do not have) and I could see there were in fact many similarities, but I was not sure if I was convincing myself from a biased angle. The first thing I wanted to do was find out about the Coat of Arms and so I corresponded with the College of Arms, where ‘Chester Herald’ Timothy Duke was most helpful and confirmed that the Coat of Arms on our portrait did not exist and was a poorly added addition (a fake). He recommended that we have the portrait x Rayed as original ‘arms’ may be found beneath. I took the portrait to the top experts and connoisseurs who confirmed the age correct to Shakespeare’s period and whom were all impressed at what a fine portrait it is. We then took it to The Hamilton Kerr Institute at Cambridge University for X Ray and other tests. The X-Ray confirmed that there was indeed something previously beneath where the (fake) Coat of Arms now is and it also revealed that a shield shape was on the other side beneath over paint and this is very likely a coat of arms now hidden. I then contacted a Shakespeare Historian & author, Simon Stirling, who had been researching Shakespeare portraits for his opinion, which was very positive. We then had some actual photo shop mergers done with the Cobbe, Chandos and Droeshout, all of which were impressive, although amateur. Last summer I took the portrait to Lumiere technology in Paris (in the new lately for their work and discoveries regarding The Mona Lisa), to see if they could discover what was beneath the over paint and this research is ongoing. They did though, from the initial test, believe that the portrait was painted from life and they also made a professional video merger of the Portrait and the Droeshout, which is very impressive. In fact the only area that appears different is the one area that X ray showed had been re painted / changed. What has the reception been so far? In a word, ‘Mixed’. I really do believe from all I have learned, discovered and seen that this is a portrait of William Shakespeare. I also believe and understand that to many, this is “Too good to be true”. We are somewhat stuck in so much as we really need a heavy weight academic ‘scholar’ behind us, but this is difficult without a ‘Heavy weight’ Institution behind us, and we cannot get such an institution behind us without the scholar! As one art historian put it, “I cannot help investigate based on the portrait being Shakespeare, there are too many academic ships wrecks on that shore”! This is of course rather frustrating, as even though I am convinced and other have agreed, the people we need to take this seriously for it to move forward, aren’t, as it is easier to say no, rather than yes and then be proven wrong. It is a shame as we are not actually asking anyone to say THIS IS WILLIAM SHAKESPEARE, we are asking for them to take the possibility seriously and help us prove that it is, or indeed is not! It is clear that no portrait of Shakespeare will turn up with a full provenance, none has yet. Therefore, if we have a portrait that looks as though it could in fact be a life portrait, should we ignore it or try to find out more? One last point on reception so far. At the beginning I naively thought that the owners of the other portraits suspected (as none are proven) as Shakespeare may assist me. Wrong! Let’s just say that the response from some showed a degree of what I believe was serious concern of a new kid on the block, and their comments rather than put me off, convinced me further that I am correct! You have speculated around the fact that Shakespeare may have been Catholic, what made you think that might have been the case? Of course, the possibility of Shakespeare being a ‘secret’ catholic, or at the least a catholic sympathiser is not a new idea. The debate on his religious beliefs has raged for years. It is not really something I had ever thought about or believe would really matter, but as I have said, my research has included the reading of many articles and books about Shakespeare and his life and the catholic angle keeps coming up and seems to be suggested by some historians far more educated in the matter than me. It is something one has to decide for one’s self, but from what I have read, understanding the times, his families links with well-known Catholic families, his families previous beliefs & parts of his works that some think may allude to the faith, I personally believe that it is likely that he was Catholic (I am not, so I have no agenda on this) or at the least it should not be ruled out. One can understand how that, if so, may have posed a problem during Shakespeare´s own lifetime, only decades after the suppression of the Monastic system, but you suggest that it, if confirmed, could be less than favourably received even today, why? I do believe that there may be elements of society ‘even today’ that may not favourably receive the news that Shakespeare was Catholic. But I do not want to believe it and hope that I am wrong and indeed would be happy to be wrong. My thoughts on this and I am no expert and would happily be corrected, is that whilst England (and I say England deliberately rather than the UK) is an extremely tolerant country of race and religion there are (as expect there are in most countries) bound to be undercurrents of distrust, fear or scepticism regarding religions other than ‘your own’, of course these are unfounded and unspoken, but to some they are there. With England, over the last few centuries since the late 16th century, not so now, the ‘enemy’ (for want of a better word) was generally Catholic / or Catholic countries, of course, James 1st tried to court both Catholic and Protestant nations, but generally the anti-catholic feeling was prevalent in the country from then and onwards. This did not lessen as late as Victorian times, which, let’s face it were really only just over a hundred years ago! This may seem like a long time ago, but this is brought into perspective, when you realise our current queen is 90 this week! The Victorian era was one where there was much ‘ant-catholic’ sentiment, through news articles, pamphlets and even in a type of propaganda through fictional books. This ‘anti-Catholic’ atmosphere was far less prevalent after the second world war, but even if we look to the last half century, the ‘troubles’ in Ireland did not help with Catholic / Protestant relations and again thankfully things now are much better as they should be. But the point is this, the English for the last few hundred years have had this ‘drummed’ into them through History lessons, books and media, not obviously lately, but nevertheless there. It is very difficult for a Catholic to be Prime Minister, there are restrictions on the royal family (although this has been improved lately). And so I think it is very likely that there are likely to be elements of the English establishment event today, which would be less than enthusiastic about England’s greatest cultural export turning out to have been Catholic. I am sure though, that overtime, this will become less and less of a problem. 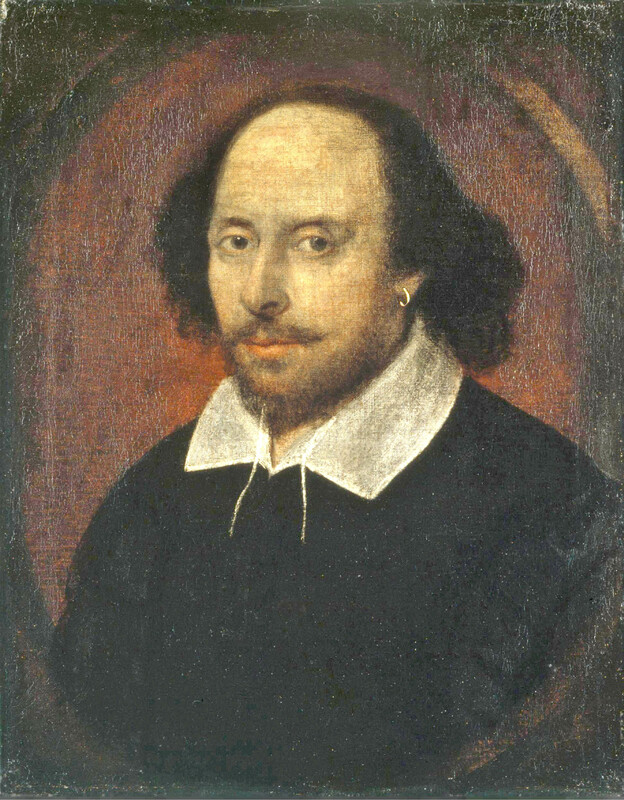 Do you at the moment see a point where your “suspicions” that the painting is indeed a previously unknown painting of William Shakespeare will be confirmed? Bearing in mind that (although I believe they are) The Chandos & now the Cobbe are not 100% proven to be Shakespeare and I believe, now, never can be & even the much researched ‘Sanders’ meets objections from many scholars (I am not sure about that one), my answer is a definite YES. Our portrait has a certain mystery to it and all that have seen it, (including technical research) agree that whoever the sitter is, at some point there has been a deliberate attempt to disguise the identity. Which has of course worked, and would explain why no one realised it was Shakespeare (if it is) many years ago. We are confident that beneath overpaint is inscription and a coat of arms or crest of some type. If we are unlucky, these have been completely scratched off and then, no we will never know, but if they were completely scratched off, we would not (I believe) be able to see the shield shape in the X Ray) and so I am confident that we will be lucky and find what is beneath. This will then prove that tis portrait is William Shakespeare, or that it is not! The real question is when? We are nervous and reluctant to have the overpaint physically removed to find what is beneath, as careful as restorers are, it is not 100% safe and any ‘accident’ could then result in any evidence beneath being wiped away for ever. This is why we are publicising our predicament in the hope that at some point an institution may come forward with technology that can see what is beneath for us, without physically interfering with the portrait. We have taken it to such a place in Paris, but they are a commercial enterprise and thus can only assist us to a point. That said, they are so interested, that their research is ongoing for us, but commercial work has to come first and their work on the Mona Lisa took over ten years! Thus we are keen to have other different technical analysis carried out alongside that research. If at all possible.